In a nearby caf� Florence awaits her lover to arrive. But�Julien can hardly believe his eyes: there is a piece of rope hanging from Monsieur Carala's balcony. Stupid, o, how stupid, only an amateur could do such a childish mistake!! He throws his coat on the passenger's seat and runs back to the building. Julien must take the piece of rope and hide it away. And he must do so quickly, before the night guard turns off the electricity and locks the empty building. Julien reaches for the elevator's door. 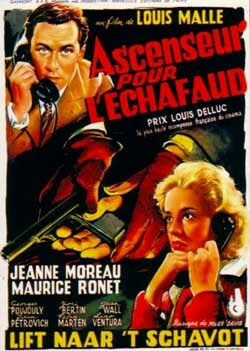 Ascenseur pour l'�chafaud a.k.a Elevator to the Gallows (1958) is a film that like so many other French crime thrillers from the early 1950's did not quite fit the noir bill which the early 1940s mastered to perfection. While the story and the characters were somewhat familiar they were all intertwined together in a mix that anything but reflected the well-established crime-formula from the period. Elevator to the Gallows was more of a transition picture that flagged the emergence of the French Nouvelle Vague while at the same time remained quite restrained in both style and presentation. Compared to the works of Goddard, Truffault, and Rivette the film was still a student willing to learn as quickly as possible.